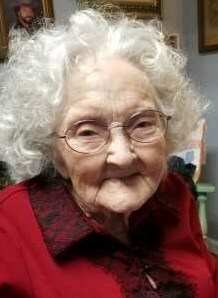 Alene Oneta (Hunter) Pogue, 97, went peacefully in her sleep to join the Lord on January 18, 2019. She will rejoice in reuniting with those who have gone before and were there patiently awaiting her always late arrival. Alene is preceded in death by her parents Leonard B. Hunter and Edna Ruth Campbell; her siblings' her loving husband of 63 years, R.K. Pogue, Sr.; and her beloved son, Robert "Keith" Pogue, Jr.
She is survived by her daughter, Ronna Pogue Edwards; son, Patrick Keith Pogue; grandchildren, Stacy Pogue-Stith, Stanley Edwards, Shonna Michael Edwards, Ryan Pogue, and Donald Pogue; great-grandchildren, Erin Benton, Jace Edwards, Kierstin Riels, Peyton Edwards, Trey Pogue, Emmaline Freeman-Pogue, Dreya Pogue, and Penelope Freeman-Pogue; great-great-grandchildren, Riley Benton and Ethne Benton; and many treasured nieces, nephews, and precious friends. Alene grew up during the Great Depression, traveling throughout Texas and Oklahoma with her family as a child as they helped to build churches. As a young woman she was a true trailblazer, working as a ranch hand and at Fox Studios before enlisting and serving at Fort Sam Houston, Texas, in the 1857th Service Command Unit WAC Detachment during WWII. She continued to work various home-based businesses once becoming a wife, a mother, and eventually a grandmother. She was an unfiltered, outspoken, fierce powerhouse packed into a petite frame that loved to plant flowers, tell stories, and take in strays. She will be greatly missed. Her graveside services will be held at Brookside Memorial Park (13747 Eastex Freeway, Houston, TX 77039) on Saturday January 26, 2019. For those wishing to do something in honor of her, Alene explicitly requested that in lieu of flowers she would rather have donations be made to Honor Flight Bluegrass (P.O. Box 991364, Louisville, KY 40269) or to Kerens Veterans Memorial (P.O. Box 71, Kerens, TX 75144). Please consider sharing a memory of Alene or leaving a special message for her family using the "Share Memories" section below. Add your memories to the guest book of Alene Pogue. I had the pleasure of meeting Alene when she moved in with Stacy and Ray. She was an interesting lady with lots of stories to tell.